C.M. 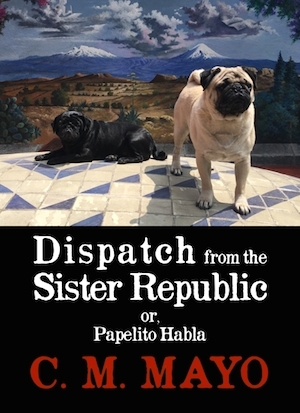 Mayo's longform essay, "Dispatch from the Sister Republic or, Papelito Habla," a look at the Mexican literary landscape and the power of the book, is now available in Kindle. 2015 Metaphysical Odyssey into the Mexican Revolution wins the Indie Excellence Award for History. More news, including presentations at the University of California San Diego, Stanford University, University of El Paso, many interviews, and more on the book's home page. C.M. Mayo presents Metaphysical Odyssey into the Mexican Revolution: Francisco I. Madero and His Secret Book, Spiritist Manual in the PEN San Miguel Lecture Series, January 13, Bellas Artes, San Miguel de Allende, Mexico. Listen to this recorded event anytime. Transcript of C.M. mayo's talk for the American Literary Translators Association (ALTA) in Milkwakee, November, 2014. 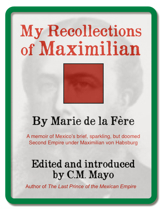 A free ebook now available as a PDF download: "My Recollections of Maximilian" by Marie de la Fere, a rare circa 1910 English language eyewitness memoir, edited and introduced by C.M. Mayo. We're working on the summer 2012 iBook by C.M. 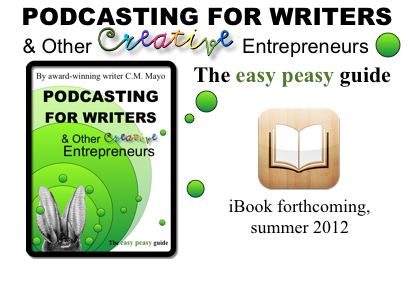 Mayo, Podcasting for Writers & Other Creative Entrepreneurs. Stay tuned. A first iBook, the short story, "The Building of Quality," has been submitted and is awaiting approval from iTunes. Forthcoming iBook, fingers crossed, in June: From Mexico to Miramar or, Across the Lake of Oblivion. Both titles are already availble in Kindle editions. As part of the series of occasional Conversations with Other Writers, C.M. Mayo talks with Mexican art and literature expert Michael K. Schuessler, author of the biographies of two major Mexican literary figures, Gualadupe Amor: La undécima musa and Elena Poniatowska: An Intimate Portrait, and editor of Alma Reed's long lost autobiography, Peregrina: Love and Death in Mexico. *About one hour and 7 minutes. New workshops: C.M. Mayo will be teaching at the Writer's Center in Bethesda MD (just outside Washington DC) this May 5th with Podcasting for Writers and How (and How Not) to Write Dialogue. New podcast: C.M. Mayo discusses the secret book of 1911 by the leader of Mexico's 1910 Revolution, Francisco I. Madero, Spiritist Manual. Recorded at the PEN / Sol Literary Magazine Reading Series, February 22, 2012, San Miguel de Allende, Mexico (in Engish). New podcast: C.M. Mayo interviews Edward Swift, author of the memoir My Grandfather's Finger and many acclaimed novels, including Splendora and The Daughter of the Doctor and the Saint. New interview by Rose Mary Salum with C.M. Mayo in Literal Magazine Blog about translating Francisco I. Madero's secret book, Spiritist Manual. The latest Dancing Chiva newsletter is available here. Please know that we value your privacy; we do not share our list. We use "Mail Chimp," a leading e-mail list management service which allows you to instantly opt out at any time. C.M. Mayo offers 10 Tips to help you get the most from your writing workshop; plus an interview with with memoirist and travel writer Sara Mansfield Taber. Upcoming C.M. 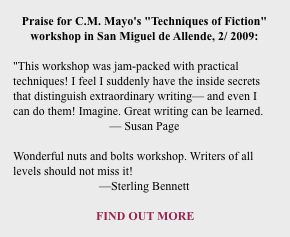 Mayo workshops: February 20 and 21 in San Miguel de Allende, Mexico, directly following the San Miguel Writers Conference. Click here for more information and to register on-line. Click here to read the complete November newsletter with news about e-books, workshops, articles, podcasts, and much more. Announcing the publication of the first English language translation of Francisco I. Madero's secret book, Spiritist Manual, 1911. For Q & A with translator C.M. Mayo, and resources for researchers, visit the book's website. C.M. Mayo will be discussing this most unusual book and its importance for understanding the Mexican Revolution, at the Author's Sala in San Miguel de Allende on November 10, 2011. Plus, listen to two new podcasts for writers: "The Number One Technique in the Supersonic Overview" and "How to Break a Writing Block." Follow our blog, "The Bleat"
Two new e-books now available on Kindle. E-book. Now available on Kindle. 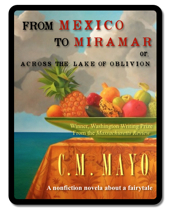 "From Mexico to Miramar or, Across the Lake of Oblivion," the first title in the Maximiliana series, is now available in both PDF and Kindle editions. New video, "At Play in the Fields of Keynote," C.M. Mayo on designing e-book covers. New podcasts, including several on creative writing. E-book editions of C.M. 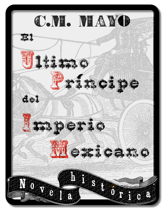 Mayo's Miraculous Air, El último príncipe del Imperio Mexicano, and a short story, "Manta Ray," as well as Marie de la Fere's My Recollections of Maximilian, and Francisco I. Madero's Spiritist Manual are all in production for summer and fall 2011. One of the simplest yet most effective techniques of fiction. A blog post based on my talk on a panel about writing historical fiction, American Independent Writer's Conference, 2011. Includes a handout of recommended reading. A blog post at Madam Mayo. Also a 7 minute podcast, click here to download and listen now. 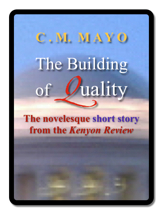 Now for sale as both Kindle and PDF download: "The Building of Quality," the novelesque short story by C.M. Mayo, from the Kenyon Review. Free to anyone who joins the (also free) Dancing Chiva Literary Arts Club: C.M. Mayo on Creative Writing: The Best from the Blog. Click here to download it now. The schedule will be updated soon. C.M. Mayo will also be offering a one day "Techniques of Fiction" workshop at the Writer's Center (near Washington DC) in September. Click here for more details. 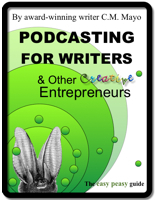 Many more free podcasts for writers here. Notes about the cover designs now on-line. New on Kindle: C.M. Mayo's short story from the Kenyon Review, "The Building of Quality." We're getting ready to publish our first newsletter! Want to receive it? Click here to join up! You'll also receive a free e-book, "C.M. Mayo on Creative Writing: The Best from the Blog," a series of inspiring and practical tips for writers. New on the website: Q & A with C.M. Mayo. Coming soon: an archive of the newsletters. C. M. Mayo's popular "Techniques of Fiction" one day workshop will be offered in Mexico City on Saturday, May 28, 2011. In our shop: PayPal is up and running. You can now pay instantly and safely using any major credit card. We have also re-issued C.M. Mayo's award-winning double CD, "From Mexico to Miramar or, Across the Lake of Oblivion" about a visit to Maximilian's castle in Trieste. For more about our forthcoming Maximiliana, join the Dancing Chiva Literary Arts Club! You will receive advance news, special discounts and more! We're blogging at The Bleat! Our all new bodaciously user-friendly website is up & running, with Mail Chimp, Twitter, "The Bleat" blog, and more, check it out! C.M. Mayo's popular "Techniques of Fiction" one day workshop will be offered in Mexico City on Saturday, May 28. This is a one day only workshop, from 10 am - 2 pm. Visit our Workshop page for a full description and to register on-line (on-line registration available shortly). P.S. There may be a second one day workshop in the Los Cabos area in Baja California Sur, also in May; check back for new about that next month (or, to be notified, click here). Our e-book titles will be available on iBooks and Kindle (amazon.com), and our own on-line shop will offer some very unusual autographed limited editions. More news soon; stay tuned. Our completely redesigned webpage is under construction! We will be launching several e-books and limited editions in 2011. We invite you to view our catalog, which features forthcoming Baja Californiana, Maximiliana, and Works for Writers. C.M. Mayo's "Techniques of Fiction" one day workshop will be offered in Mexico City this spring; look for on-line registration on the workshop page soon. Listen to a new podcast , "Hell, I Knew It Was Paradise," from one of our forthcoming e-books, C. Mayo's widely-lauded travel memoir of Baja California, Miraculous Air. We have now have a YouTube channel. At present it shows "trailers" for books (all in print and available in paperback on www.amazon.com from other publishers) by C.M. Mayo. We will be adding more videos for the forthcoming Dancing Chiva titles in the coming weeks. 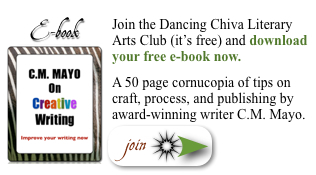 Learn about membership in the Dancing Chiva Literary Arts Club here. Follow our blog, The Bleat! Our e-book titles will be available on iBooks and Kindle (amazon.com), and our own on-line shop will offer some very unusual autographed limited editions. Stay tuned.